For paying space tourists, see Space tourism. For general commercial use of space, see Commercialization of space. For entrepreneurial space ventures and colonization, see NewSpace. Private spaceflight is a spaceflight or the development of new spaceflight technology that is conducted and paid for by an entity other than a government agency. 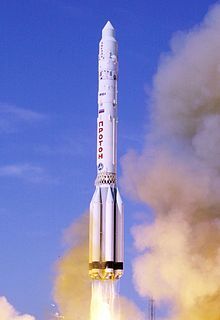 In the early decades of the Space Age, the government space agencies of the Soviet Union and United States pioneered space technology in collaboration with affiliated design bureaus in the USSR and private companies in the US, entirely funding both the development of new spaceflight technologies and the operational costs of spaceflight. The European Space Agency was formed in 1975, largely following the same model of space technology development. Later on, large defense contractors began to develop and operate space launch systems, derived from government rockets. Private spaceflight in Earth orbit includes communications satellites, satellite television, satellite radio, astronaut transport and sub-orbital and orbital space tourism. In the 2000s, entrepreneurs began designing—and by the 2010s, deploying—space systems competitive to the national-monopoly governmental systems of the early decades of the space age. :7 These new offerings have brought about significant market competition in space launch services after 2010 that had not been present previously. Successes to date include flying suborbital spaceplanes, launching orbital rockets, flying two orbital expandable test modules (Genesis I and II), and the successful development of first-stage orbital launch vehicles that are able to vertically land after a launch so as to enable reuse. The most powerful rocket in operation as of 2018, the Falcon Heavy, was privately developed. Planned private spaceflights beyond Earth orbit include personal spaceflights around the Moon. Two private orbital habitat prototypes are already in Earth orbit, with larger versions to follow. Planned private spaceflights beyond Earth orbit include solar sailing prototypes (LightSail-3). In a 2012 article by Bloomberg News, author Michael Burgan asserted that there is a "grand tradition of private wealth furthering advances in rocketry and space exploration" dating back to the early rocketry experiments of Robert Goddard. Despite those earlier private undertakings, during the principal period of spaceflight in the mid-twentieth century, only nation states developed and flew spacecraft above the Kármán line, the nominal boundary of space. Spaceflight was thus the monopoly province of a small group of national governments. Both the U.S. civilian space program and Soviet space program were operated using mainly military pilots as astronauts. During this period, no commercial space launches were available to private operators, and no private organization was able to offer space launches. Eventually, private organizations were able to both offer and purchase space launches, thus beginning the period of private spaceflight. The first phase of private space operation was the launch of the first commercial communications satellites. The U.S. Communications Satellite Act of 1962 opened the way to commercial consortia owning and operating their own satellites, although these were still launched on state-owned launch vehicles. In 1980, the European Space Agency created Arianespace, a company to be operated commercially after initial hardware and launch facilities were developed with government funding. By 1995 Arianespace lofted its 100th satellite and by 1997 the Ariane rocket had its 100th launch. Arianespace's 23 shareholders represent scientific, technical, financial and political entities from 10 different European countries. The history of full private space transportation includes early efforts by German company OTRAG in the 20th century, and numerous modern orbital and suborbital launch systems in the 21st century. More recent commercial spaceflight projects include the suborbital flights of Virgin Galactic and Blue Origin, the orbital flights of SpaceX and other COTS participants. Development of alternatives to government-provided space launch services began in earnest in the 2000s. Private interests began funding limited development programs, but the US government later sponsored a series of programs to incentivize and encourage private companies to begin offering both cargo, and later, crew space transportation services. Lower prices for launch services after 2010, and published prices for standard launch services, have brought about significant space launch market competition that had not been present previously. By 2012, a private company had begun transporting cargo to and from the International Space Station (ISS), while a second private company was scheduled to begin making deliveries in 2013, ushering in a time of regular private space cargo delivery to and return from the government-owned space facility in low-Earth orbit (LEO). In this new paradigm for LEO cargo transport, the government contracts for and pays for cargo services on substantially privately developed space vehicles rather than the government operating each of the cargo vehicles and cargo delivery systems. As of 2013[update], there is a mix of private and government resupply vehicles being used for the ISS, as the Russian Soyuz and Progress vehicles, and the European Space Agency (ESA) ATV (through 2014) and the Japanese Kounotori (through 2021) remain in operation after the 2011 retirement of the US Space Shuttle. In June 2013, British newspaper The Independent claimed that "the space race is flaring back into life, and it's not massive institutions such as NASA that are in the running. The old view that human space flight is so complex, difficult and expensive that only huge government agencies could hope to accomplish it is being disproved by a new breed of flamboyant space privateers, who are planning to send humans out beyond the Earth's orbit for the first time since 1972," particularly noting projects underway by Mars One, Inspiration Mars Foundation, Bigelow Aerospace and SpaceX. Yet one of NASA's early actions was to effectively ban private space flight through a mountain of red tape. From the beginning, though, this met significant opposition not only by the private sector, but in Congress. In 1962, Congress passed its first law pushing back the prohibition on private involvement in space, the Communications Satellite Act of 1962. While largely focusing on the satellites of its namesake, this was described by both the law's opponents and advocates of private space, as the first step on the road to privatization. While launch vehicles were originally bought from private contractors, from the beginning of the Shuttle program until the Challenger disaster in 1986, NASA attempted to position its shuttle as the sole legal space launch option. But with the mid-launch explosion/loss of Challenger came the suspension of the government-operated shuttle flights, allowing the formation of a commercial launch industry. On 30 October 1984, US President Ronald Reagan signed into law the Commercial Space Launch Act. This enabled an American industry of private operators of expendable launch systems. Prior to the signing of this law, all commercial satellite launches in the United States were restricted by Federal regulation to NASA's Space Shuttle. On 5 November 1990, United States President George H. W. Bush signed into law the Launch Services Purchase Act. The Act, in a complete reversal of the earlier Space Shuttle monopoly, ordered NASA to purchase launch services for its primary payloads from commercial providers whenever such services are required in the course of its activities. In 1996 the United States government selected Lockheed Martin and Boeing to each develop Evolved Expendable Launch Vehicles (EELV) to compete for launch contracts and provide assured access to space. The government's acquisition strategy relied on the strong commercial viability of both vehicles to lower unit costs. This anticipated market demand did not materialize, but both the Delta IV and Atlas V EELVs remain in active service. Commercial launches outnumbered government launches at the Eastern Range in 1997. The Commercial Space Act was passed in 1998 and implements many of the provisions of the Launch Services Purchase Act of 1990. Nonetheless, until 2004 NASA kept private space flight effectively illegal. But that year, the Commercial Space Launch Amendments Act of 2004 required that NASA and the Federal Aviation Administration legalize private space flight. The 2004 Act also specified a "learning period" which restricted the ability of the FAA to enact regulations regarding the safety of people who might actually fly on commercial spacecraft through 2012, ostensibly because spaceflight participants would share the risk of flight through informed consent procedures of human spaceflight risks, while requiring the launch provider to be legally liable for potential losses to uninvolved persons and structures. To the end of 2014, commercial passenger flights in space has remained effectively illegal, as the FAA has refused to give a commercial operator's license to any private space company. The SPACE Act includes the extension of indemnification of US launch providers for extraordinary catastrophic third-party losses of a failed launch through 2025, while the previous indemnification law was scheduled to expire in 2016. The Act also extends, through 2025, the "learning period" restrictions which limit the ability of the FAA to enact regulations regarding the safety of spaceflight participants. Indemnification for extraordinary third-party losses has, as of 2015, been a component of US space law for over 25 years, and during this time, "has never been invoked in any commercial launch mishap." In 1992, Resurs-500 capsule containing gifts was launched from Plesetsk Cosmodrome in what was a private spaceflight called Europe-America 500. The flight was conceived by the Russian Foundation for Social Inventions and TsSKB-Progress, a Russian rocket-building company, to increase trade between Russia and USA, and promote use of technology once reserved only for military forces. Money for the launch was raised from a collection of Russian companies. The capsule parachuted into the Pacific Ocean and was brought to Seattle by a Russian missile-tracking ship. Since 1995 Khrunichev's Proton rocket is marketed through International Launch Services while the Soyuz rocket is marketed via Starsem. The Sea Launch project flies the Ukrainian Zenit rocket. In 2003 Arianespace joined with Boeing Launch Services and Mitsubishi Heavy Industries to create the Launch Services Alliance. In 2005, continued weak commercial demand for EELV launches drove Lockheed Martin and Boeing to propose a joint venture called the United Launch Alliance to service the United States government launch market. Since the 1980s, various private initiatives have started up to pursue the private use of space. The first privately funded rocket to achieve spaceflight was Conestoga I, which was launched by Space Services Inc. on a suborbital flight to 309 km (192 mi) altitude on 9 September 1982. In the early 2000s, several public-private partnerships were established in the United States to take advantage of entrepreneurial companies to accelerate spaceflight technology development and reduce the cost of access to space, both for cargo and passengers transport. In addition, several purely private initiatives have begun in the 2010s to develop various aspects of space technology such as reusable launch systems and private spaceflight endeavors to the inner solar system. On 17 December 2003—on the 100th anniversary of the Wright brothers first powered flight of an aircraft—SpaceShipOne, an experimental spaceplane piloted by Brian Binnie, made its first rocket-powered flight, the first privately built craft to ever achieve supersonic flight. :8 The next year, SpaceShipOne made three suborbital flights into space, becoming the first privately built and operated vehicle to achieve manned spaceflight. In May 2015, the Japanese legislature is considering legislation to allow private company spaceflight initiatives in Japan. The development of commercial space transportation will need airspace integration and air traffic management adaptation. Today many commercial space transportation companies offer launch services to satellite companies and government space organizations around the world. In 2005 there were 18 total commercial launches and 37 non-commercial launches. Russia flew 44% of commercial orbital launches, while Europe had 28% and the United States had 6%. China's first private launch, a suborbital flight by OneSpace, took place in May 2018. In recent years, the funding to support private spaceflight has begun to be raised from a larger pool of sources than the relatively more limited sources of the 1990s. For example, as of June 2013[update] and in the United States alone, ten billionaires have made "serious investments in private spaceflight activities" at six companies, including Stratolaunch Systems, Planetary Resources, Blue Origin, Virgin Galactic, SpaceX, and Bigelow Aerospace. The ten investors are Paul Allen, Larry Page, Eric E. Schmidt, Ram Shriram, Charles Simony, Ross Perot, Jr., Jeff Bezos, Richard Branson, Elon Musk, and Robert Bigelow. It is not yet clear to what extent these entrepreneurs see "legitimate business opportunity, [for example,] space tourism and other commercial activities in space, or [are] wealthy men seeking the exclusivity that space offers innovators and investors." These investments are a "gamble", and may, or may not pay off. The space transport business has, historically, had its primary customers in national governments and large commercial segments. Launches of government payloads, including military, civilian and scientific satellites, was the largest market segment in 2007 at nearly $100 billion a year. This segment is dominated by domestic favorites such as the United Launch Alliance for U.S. government payloads and Arianespace for European satellites. The commercial payload segment, valued at under $3 billion a year, was dominated by Arianespace in 2007, with over 50% of the market segment, followed by Russian launchers. See a complete list of launch systems. The SpaceX Dragon berthing with the ISS during its final demonstration mission, on 25 May 2012. The US government determined to begin a process to purchase orbital launch services for cargo deliveries to the International Space Station (ISS) beginning in the mid-2000s, rather than operate the launch and delivery services as they had with the Space Shuttle, which was to retire in less than half a decade, and ultimately did retire in 2011. On 18 January 2006, NASA announced an opportunity for US commercial providers to demonstrate orbital transportation services. As of 2008, NASA planned to spend $500 million through 2010 to finance development of private sector capability to transport payloads to the International Space Station (ISS). [needs update] This was considered more challenging than then-available commercial space transportation because it would require precision orbit insertion, rendezvous and possibly docking with another spacecraft. The commercial vendors competed in specific service areas. In August 2006, NASA announced that two relatively young aerospace companies, SpaceX and Rocketplane Kistler, had been awarded $278 million and $207 million, respectively, under the COTS program. In 2008, NASA anticipated that commercial cargo delivery services to and return services from the ISS would be necessary through at least 2015. The NASA Administrator suggested that space transportation services procurement may be expanded to orbital fuel depots and lunar surface deliveries should the first phase of COTS prove successful. After it transpired that Rocketplane Kistler was failing to meet its contractual deadlines, NASA terminated its contract with the company in August 2008, after only $32 million had been spent. Several months later, in December 2008, NASA awarded the remaining $170 million in that contract to Orbital Sciences Corporation to develop resupply services to the ISS. Before 2004, the year it was legalized in the US, no privately operated manned spaceflight had ever occurred. The only private individuals to journey to space went as space tourists in the Space Shuttle or on Russian Soyuz flights to Mir or the International Space Station. All private individuals who flew to space before Dennis Tito's self-financed International Space Station visit in 2001 had been sponsored by their home governments or by private corporations. Those trips include US Congressman Bill Nelson's January 1986 flight on the Space Shuttle Columbia and Japanese television reporter Toyohiro Akiyama's 1990 flight to the Mir Space Station. The Ansari X PRIZE was intended to stimulate private investment in the development of spaceflight technologies. 21 June 2004, test flight of SpaceShipOne, a contender for the X PRIZE, was the first human spaceflight in a privately developed and operated vehicle. On 27 September 2004, following the success of SpaceShipOne, Richard Branson, owner of Virgin and Burt Rutan, SpaceShipOne's designer, announced that Virgin Galactic had licensed the craft's technology, and were planning commercial space flights in 2.5 to 3 years. A fleet of five craft (SpaceShipTwo, launched from the WhiteKnightTwo carrier airplane) were to be constructed, and flights would be offered at around $200,000 each, although Branson said he planned to use this money to make flights more affordable in the long term. A test flight of SpaceShipTwo crashed in October 2014. In December 2004, United States President George W. Bush signed into law the Commercial Space Launch Amendments Act. The Act resolved the regulatory ambiguity surrounding private spaceflights and is designed to promote the development of the emerging U.S. commercial human space flight industry. Zero2infinity, a Spanish aerospace company, is developing a high-altitude balloon-based launch vehicle termed a bloostar to launch small satellites to orbit for customers. The B612 Foundation is currently designing and building an asteroid-finding space telescope named Sentinel, with plans to launch it in 2016. The Planetary Society, a nonprofit space research and advocacy organization, has sponsored a series of small satellites to test the feasibility of solar sailing. Their first such project, Cosmos 1, was launched in 2005 but failed to reach space, and was succeeded by the Lightsail series, the first of which launched on 20 May 2015. A second spacecraft is expected to launch in 2016 on a more complex mission. Copenhagen Suborbitals is a crowd funded amateur manned space programme. As of 2016[update] it has flown four home-built rockets and two mock-up space capsules. Many have speculated on where private spaceflight may go in the near future. Numerous projects of orbital and suborbital launch systems for satellites and manned flights exist. Some orbital manned missions would be state-sponsored like most COTS participants. (that develop their own launch systems). Another possibility is for paid suborbital tourism on craft like those from Virgin Galactic, Space Adventures, XCOR Aerospace, RocketShip Tours, ARCASPACE, PlanetSpace-Canadian Arrow, British Starchaser Industries or non-commercial like Copenhagen Suborbitals. Additionally, suborbital spacecraft have applications for faster intercontinental package delivery and passenger flight. SpaceX's Falcon 9 rocket, first launched in 2010 with no passengers, was designed to be subsequently human-rated. The Atlas V launch vehicle is also a contender for human-rating. Plans and a full-scale prototype for the SpaceX Dragon, a capsule capable of carrying up to 7 passengers, were announced in March 2006, and Dragon version 2 flight hardware was unveiled in May 2014. As of September 2014[update], both SpaceX and Boeing have received contracts from NASA to complete building, testing, and flying up to six flights of human-rated space capsules to the International Space Station beginning in 2017. In December 2010, SpaceX launched the second Falcon 9 and the first operational Dragon spacecraft. The mission was deemed fully successful, marking the first launch to space, atmospheric reentry and recovery of a capsule by a private company. 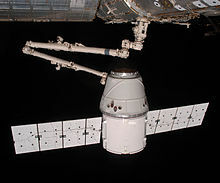 Subsequent COTS missions included increasingly complex orbital tasks, culminating in Dragon first docking to the ISS in 2012. Bigelow Aerospace develops BA 330 module (based on the former NASA TransHab design) intended to be used for activities like microgravity research, space manufacturing, and space tourism with modules serving as orbital "hotels". To promote private manned launch efforts, Bigelow offered the US$50 million America's Space Prize for the first US-based privately funded team to launch a manned reusable spacecraft to orbit on or before 10 January 2010; such feat is yet to be achieved as of December 2018[update]. The British Government partnered in 2015 with the ESA to promote a possibly commercial single-stage to orbit spaceplane concept called Skylon. This design was pioneered by the privately held Reaction Engines Limited, a company founded by Alan Bond after HOTOL was canceled. As of 2012, private company NanoRacks provides commercial access to the US National Laboratory space on the International Space Station (ISS). Science experiments can be conducted on a variety of standard rack-sized experimental platforms, with standard interfaces for power and data acquisition. In a presentation given 15 November 2005 to the 52nd Annual Conference of the American Astronautical Society, NASA Administrator Michael D. Griffin suggested that establishing an on-orbit propellant depot is, "Exactly the type of enterprise which should be left to industry and to the marketplace." At the Space Technology and Applications International Forum in 2007, Dallas Bienhoff of Boeing made a presentation detailing the benefits of propellant depots. Shackleton Energy Company has established operational plans, an extensive teaming and industrial consortium for developing LEO Propellant Depots supplied by Lunar polar sourced water ice. Some have speculated on the profitability of mining metal from asteroids. According to some estimates, a one kilometer-diameter asteroid would contain 30 million tons of nickel, 1.5 million tons of metal cobalt and 7,500tons of platinum; the platinum alone would have a value of more than $150 billion at 2008 terrestrial prices. A space elevator system is a possible launch system, currently under investigation by at least one private venture. There are concerns over cost, general feasibility and some political issues. On the plus side the potential to scale the system to accommodate traffic would (in theory) be greater than some other alternatives. Some factions contend that a space elevator — if successful — would not supplant existing launch solutions but complement them. Since 2005, there has been US$10 billion of private capital invested in the space sector, most of it in the United States which liberalized private space sector investment beginning in the 1980s, with additional legislative reforms in the 1990s–2000s. From 2000 through the end of 2015, a total of US$13.3 billion of investment finance has been invested in the space sector, with US$2.9 billion of that being venture capital. In 2015 alone, venture capital firms invested US$1.8 billion in private spaceflight companies, more than they had in the previous 15 years combined. As of October 2015[update], the largest and most active investors in space were Lux Capital, Bessemer Venture Partners, Khosla, Founders Fund, RRE Ventures and Draper Fisher Jurvetson. Some investors see the traditional spaceflight industry as ripe for disruption, with "a 100-fold improvement [relatively straightforward and] a thousand-fold improvement [possible]." Increasing interest by investors in economically driven spaceflight had begun to appear by 2016, and some space ventures have had to turn away investor funding. After earlier first effort of OTRAG, in the 1990s the projection of a significant demand for communications satellite launches attracted the development of a number of commercial space launch providers. The launch demand largely vanished when some of the largest satellite constellations, such as 288 satellite Teledesic network, were never built. In 1996 NASA selected Lockheed Martin Skunk Works to build the X-33 VentureStar prototype for a single stage to orbit (SSTO) reusable launch vehicle. In 1999, the subscale X-33 prototype's composite liquid hydrogen fuel tank failed during testing. At project termination on 31 March 2001, NASA had funded $912 million of this wedge shaped spacecraft while Lockheed Martin financed $357 million of it. The VentureStar was to have been a full-scale commercial space transport operated by Lockheed Martin. In 1997 Beal Aerospace proposed the BA-2, a low-cost heavy-lift commercial launch vehicle. On 4 March 2000, the BA-2 project tested the largest liquid rocket engine built since the Saturn V. In October 2000, Beal Aerospace ceased operations citing a decision by NASA and the Department of Defense to commit themselves to the development of the competing government-financed EELV program. In 1998 Rotary Rocket proposed the Roton, a Single Stage to Orbit (SSTO) piloted Vertical Take-off and Landing (VTOL) space transport. A full scale Roton Atmospheric Test Vehicle flew three times in 1999. After spending tens of millions of dollars in development the Roton failed to secure launch contracts and Rotary Rocket ceased operations in 2001. Excalibur Almaz had plans in 2007 to launch a modernized TKS Spacecraft (for Almaz space station), for tourism and other uses. It was to feature the largest window ever on a spacecraft. Their equipment was never launched, and their hangar facility closed in 2016. It is to be converted into an educational exhibit. Escape Dynamics operated from 2010 to 2015, with the goal of making single-stage to orbit spaceplanes. In December 2012, the Golden Spike Company announced plans to privately transport space exploration participants to the surface of the Moon and return, beginning as early as 2020, for US$750 million per passenger. XCOR Aerospace planned to initiate a suborbital commercial spaceflight service with the Lynx rocketplane in 2016 or 2017 at $95,000. First test flights to be conducted by 23 pilots from the Axe Apollo Space Academy, one of which is a Filipino named Chino Roque, were planned for 2015. By 2010, Bigelow Aerospace was developing the Next-Generation Commercial Space Station, a private orbital space complex. The space station was to have been constructed of both Sundancer and B330 expandable modules as well as a central docking node, propulsion, solar arrays, and attached crew capsules. Initial launch of space station components was planned for 2014, with portions of the station projected to be available for leased use as early as 2015. As of 2018[update], no launches have taken place. Shackleton Energy Company intends to undertake human tended lunar prospecting for water ice. If significant reserves of ice are located, they plan to establish a network of "refueling service stations" in low Earth orbit and on the moon to process and provide fuel and consumables for commercial and government customers. If the prospecting is successful—ice deposits are located, the appropriate legal regime is in place to support commercial development, and the ice can be extracted — Shackleton proposes to establish a fuel-processing operation on the lunar surface and in propellant depots in Low Earth Orbit. Equipment would melt the ice and purify the water, "electrolyze the water into gaseous hydrogen and oxygen, and then condense the gases into liquid hydrogen and liquid oxygen and also process them into hydrogen peroxide, all of which could be used as rocket fuels." In June 2012, private Dutch non-profit Mars One announced a private one-way (no return) human mission to Mars with the aim to establish a permanent human colony on Mars. The plan is to send a communication satellite and path finder lander to the planet by 2016 and, after several stages, land four humans on the Martian surface for permanent settlement in 2023. A new set of four astronauts would then arrive every two years. Richard Branson, in his lifetime, is "determined to be a part of starting a population on Mars. I think its absolutely realistic. It will happen...I think over the next 20 years, we will take literally hundreds of thousands of people to space and that will give us the financial resources to do even bigger things"
In February 2013, the US nonprofit Inspiration Mars Foundation announced a plan to send a married couple on a 2018 mission to travel to Mars and back to Earth on a 501-day round trip, with no landing planned on Mars. The mission will take advantage of an infrequently occurring free return trajectory—a unique orbit opportunity which occurs only once every fifteen years—and will allow the space capsule to use the smallest possible amount of fuel to get it to Mars and back to Earth. The two-person American crew – a man and a woman – will orbit around Mars at a distance of 100 miles (160 km) of the surface. "If anything goes wrong, the spacecraft should make its own way back to Earth — but with no possibility of any short-cuts home." ^ Szondy, David (5 February 2012). "SpaceX Dragon's ultimate mission is Mars colonization". Gizmag. Archived from the original on 1 October 2012. Retrieved 13 February 2012. For decades after that first launch, space flight was a government monopoly. Even when private companies started going into space in the 1990s, it was only as providers of launch services to send commercial and government satellites into orbit. Now, all that is changing as private enterprise takes over space exploration in a manner not seen since the early days of the Hudson's Bay Company. ^ Oberg, James (January 2012). "Private Spaceflight: Up, Up, and Away". IEEE Spectrum. Archived from the original on 8 January 2012. Retrieved 31 December 2011. ^ a b c Belfiore, Michael (2007). Rocketeers: how a visionary band of business leaders, engineers, and pilots is boldly privatizing space. New York: Smithsonian Books. ISBN 978-0-06-114903-0. ^ "Circumlunar mission". Space Adventures. Archived from the original on 12 February 2015. Retrieved 15 February 2015. ^ "Special Announcement". bigelowaerospace.com. Archived from the original on 31 March 2008. Retrieved 1 April 2008. ^ Burgan, Michael (18 July 2012). "Private Space Exploration a Long and Thriving Tradition". Bloomberg News. Archived from the original on 19 July 2012. Retrieved 20 July 2012. ^ Engel, Max (1 March 2013). "Launch Market on Cusp of Change". Satellite Today. Archived from the original on 18 February 2013. Retrieved 15 February 2013. Although some governments funded vehicle development in different ways, there were no vehicles that were not the product of some form of fairly direct governmental support. Even Ariane, the most “commercial” of launch vehicles, was commercial in operation only, not in inception and development, and could easily call on government support when things went wrong. ^ "Milestones". Arianespace.com. Archived from the original on 13 January 2008. Retrieved 14 February 2008. ^ "Arianespace shareholders represent scientific, technical, financial and political entities from 10 different European countries". Arianespace.com. Archived from the original on 6 February 2008. Retrieved 14 February 2008. ^ Vance, Ashlee (2015). Elon Musk : Tesla, SpaceX, and the Quest for a Fantastic Future. New York: HarperCollins. p. 15. ISBN 978-0-06-230123-9. ^ "Europe to press ahead with Ariane 6 rocket". BBC News. Archived from the original on 15 July 2015. Retrieved 25 June 2015. ^ Belfiore, Michael (9 December 2013). "The Rocketeer". Foreign Policy. Archived from the original on 10 December 2013. Retrieved 11 December 2013. ^ Pasztor, Andy (17 September 2015). "U.S. Rocket Supplier Looks to Break 'Short Leash'". Wall Street Journal. Archived from the original on 16 October 2015. Retrieved 14 October 2015. The aerospace giants [Boeing Co. and Lockheed Martin Corp.] shared almost $500 million in equity profits from the rocket-making venture last year, when it still had a monopoly on the business of blasting the Pentagon's most important satellites into orbit. But since then, 'they've had us on a very short leash,' Tory Bruno, United Launch's chief executive, said. ^ Mann, Adam (27 December 2012). "The Year's Most Audacious Private Space Exploration Plans". Wired. Archived from the original on 17 January 2013. Retrieved 20 January 2013. ^ a b Hanlon, Michael (11 June 2013). "Roll up for the Red Planet". The Telegraph. Archived from the original on 11 April 2015. Retrieved 14 June 2013. ^ "Setting Space Transportation Policy for the 1990s" (PDF). US Congression Budget Office. 1 October 1986. Archived (PDF) from the original on 13 February 2008. Retrieved 14 February 2008. ^ a b Bromberg, Joan Lisa (1999). NASA and the Space Industry. Johns Hopkins University Press. p. 186. ISBN 978-0-8018-6532-9. On the other hand, NASA resisted the buildup of a commercial launch industry. Launching was for many years an enterprise that was run by a de facto partnership of NASA and the companies from which NASA bought launchers and launch services. NASA proposed to put an end to that enterprise in the 1980s; it sought to enthrone the shuttle as the nation's commercial, as well as government, launcher. 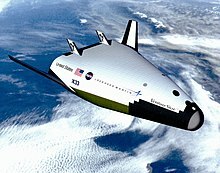 The prospect of erecting a private sector launch industry alongside the NASA shuttle was discussed, but it did not become a reality because the shuttle was too tough a competitor for private vehicles. Only the grounding of the shuttle after the Challenger accident allowed the commercial launch industry to get started. ^ a b "Statement on Signing the Commercial Space Launch Act". reagan.utexas.edu. Archived from the original on 27 September 2008. Retrieved 14 February 2008. ^ "$ 2465d. Requirement of US Federal government to procure commercial launch services". space-frontier.org. Archived from the original on 4 February 2008. Retrieved 14 February 2008. ^ "Streamlining Space Launch Range Safety - Executive Summary". National Academy of Sciences. Retrieved 13 February 2008. ^ a b "Public Law 105-303: Commercial Space Act of 1998". NASA Office of the General Counsel - Reference. NASA. 28 October 1998. Archived from the original on 2 February 2015. Retrieved 25 December 2014. U.S. law regulates private space launches, and the current law is quite unreasonable. A private company wanting to build and launch a rocket faces a mountain of red tape and very long lead times for getting approval from the government. However, although these problems add a tremendous amount of cost to private space launches, there are no laws that prohibit private space launches. The Commercial Space Launch Amendments Act, or H.R. 5382, placed a clear legislative stamp on regulations that were being formulated by the Federal Aviation Administration. Among other provisions, the law was intended to let paying passengers fly on suborbital launch vehicles at their own risk. ^ a b c Foust, Jeff (26 May 2015). "Congress launches commercial space legislation". The Space Review. Space News. Archived from the original on 27 May 2015. Retrieved 2 June 2015. Apparently the problem is that the FAA hasn't given Virgin Atlantic a commercial operator's license (at least in part because no one has set the rules for what counts as safe spaceflight). Without a commercial operator's license, it's illegal for anyone - including Virgin's billionaire owner Richard Branson - to be a passenger on space planes. Think about this for a second: the private sector will have created a plane that glides through space, just over a century after heavier than air flight was even invented, but the scolds at the FAA need extra time to fill out their paperwork. Until then, apparently, the future can't happen. ^ "H.R.2262 – 114th Congress (2015–2016): U.S. Commercial Space Launch Competitiveness Act". congress.gov. 25 November 2015. Archived from the original on 19 November 2015. Retrieved 30 November 2015. ^ a b "Space Act of 2015: American companies could soon mine asteroids for profit (Wired UK)". Wired UK. Archived from the original on 4 December 2015. Retrieved 30 November 2015. ^ "Boeing, Lockheed Martin to Form Launch Services Joint Venture". spaceref.com. Archived from the original on 9 December 2012. Retrieved 13 February 2008. ^ "Heritage: Pioneering the Commercial Space Frontier". Space Services Inc. Archived from the original on 3 August 2015. Retrieved 18 August 2015. ^ Wade, Mark. "Matagorda Island". Encyclopedia Astronautica. Archived from the original on 10 February 2014. Retrieved 18 August 2015. ^ Pittman, Bruce; Rasky, Dan; Harper, Lynn (2012). "Infrastructure Based Exploration – An Affordable Path To Sustainable Space Development" (PDF). IAC - 12, D3, 2, 4, x14203: IAC. Archived (PDF) from the original on 26 October 2014. Retrieved 14 October 2014. ^ Chang, Kenneth (2 February 2010). "Obama Calls for End to NASA's Moon Program" (PDF). nytimes.com. Archived from the original on 4 February 2010. Retrieved 1 February 2010. ^ "Private-sector rocket launch legislation eyed". Japan News. Yomiuri Shimbun. 3 June 2015. Archived from the original on 7 June 2015. Retrieved 5 June 2015. ^ Tinoco, Janet (17 May 2018). "Earth, Air, and Space: It's in the Stars". Airways International. ^ "Commercial Space Transportation: 2005 Year In Review" (PDF). faa.gov. Archived (PDF) from the original on 27 February 2008. Retrieved 13 February 2008. ^ Toh, Michelle; Wang, Serenitie (17 May 2018). "OneSpace launches China's first private rocket". CNN. Retrieved 22 May 2018. ^ a b c Berger, Eric (28 June 2013). "Ten billionaires are betting on private spaceflight: Smart or squandered money?". Houston Chronicle. Archived from the original on 1 July 2013. Retrieved 30 June 2013. ^ "Changing Trajectory: French Firms Vaults Ahead in Civilian Rocket Market". The Wall Street Journal. Dow Jones & Company, Inc.: A1 25 June 2007. ^ "NASA Seeks Proposals for Crew and Cargo Transportation to Orbit". spaceref.com. Archived from the original on 9 May 2012. Retrieved 11 February 2008. ^ "GUIDANCE_FOR_THE_PREPARATION_AND_SUBMISSION_OF_UNSOLICITED_PROPOSALS". nasa.gov. Archived from the original on 9 October 1999. Retrieved 13 February 2008. ^ "NASA Invests in Private Sector Space Flight with SpaceX, Rocketplane-Kistler". nasa.gov. Archived from the original on 23 February 2008. Retrieved 14 February 2008. ^ "Human_Space_Flight_Transition_Plan" (PDF). nasa.gov. Archived from the original (PDF) on 27 February 2008. Retrieved 14 February 2008. ^ "NASA Awards Space Station Commercial Resupply Services Contracts". nasa.gov. Archived from the original on 15 July 2016. Retrieved 24 December 2008. ^ Anatoly Zak (27 June 2015). "Soyuz TM-11: First journalist in space". SEN.com. Archived from the original on 5 October 2015. ^ Chang, Kenneth; Schwartz, John (31 October 2014). "Virgin Galactic's SpaceShipTwo Crashes in New Setback for Commercial Spaceflight". New York Times. Archived from the original on 16 December 2014. Retrieved 20 January 2015. ^ "House Approves H.R. 3752, The Commercial Space Launch Amendments Act of 2004". spaceref.com. Archived from the original on 4 January 2013. Retrieved 14 February 2008. ^ Reyes, Tim (17 October 2014). "Balloon launcher Zero2Infinity Sets Its Sights to the Stars". Universe Today. Archived from the original on 10 July 2015. Retrieved 15 July 2015. ^ "The Foundation". B612 Foundation. Archived from the original on 6 April 2012. Retrieved 13 September 2012. ^ "The Sentinel Mission". B612 Foundation. Archived from the original on 10 September 2012. Retrieved 19 September 2012. ^ Davis, Jason (26 January 2015). "It's Official: LightSail Test Flight Scheduled for May 2015". Planetary Society. Archived from the original on 1 February 2015. ^ "Falcon 9 booster rockets into orbit on dramatic first launch". SpaceflightNOW. 4 June 2010. Archived from the original on 7 June 2010. Retrieved 4 June 2010. ^ Cowing, Keith (6 March 2006). "The SpaceX Dragon: America's First Privately Financed Manned Orbital Spacecraft?". SpaceRef.com. Retrieved 12 February 2008. ^ Norris, Guy (30 May 2014). "SpaceX Unveils 'Step Change' Dragon 'V2'". Aviation Week. Archived from the original on 31 May 2014. Retrieved 18 September 2014. ^ "NASA Chooses American Companies to Transport U.S. Astronauts to International Space Station". Archived from the original on 18 September 2014. Retrieved 16 September 2014. ^ "UKSA Reviews Skylon and SABRE at Parabolic Arc". parabolicarc.com. Archived from the original on 14 June 2015. Retrieved 12 June 2015. ^ "Reaction Engines Ltd - Frequently Asked Questions". reactionengines.co.uk. Archived from the original on 2 June 2015. Retrieved 12 June 2015. ^ "Reaction Engines Limited". reactionengines.co.uk. Archived from the original on 17 June 2015. Retrieved 12 June 2015. ^ Knapp, Alex (4 March 2013). "The Space Station Is The Final Frontier Of Bio Research". Forbes. Archived from the original on 17 February 2013. Retrieved 18 February 2013. ^ "NASA and the Business of Space" (PDF). NASA. Archived (PDF) from the original on 27 February 2008. Retrieved 12 February 2008. ^ "The Potential Impact of a LEO Propellant Depot on the NASA ESAS Architecture" (PDF). Boeing. Archived from the original (PDF) on 27 February 2008. Retrieved 12 February 2008. ^ Shackleton Energy's cislunar economic development plans Archived 5 January 2013 at the Wayback Machine David Livingston interview with James Keravala, The Space Show, 14 December 2012, accessed 3 January 2013. ^ "How Asteroid Mining Will Work". howstuffworks.com. Archived from the original on 10 February 2008. Retrieved 12 February 2008. ^ "The LiftPort Space Elevator". liftport.com. Archived from the original on 12 February 2008. Retrieved 11 February 2008. ^ a b Nordrum, Amy (9 October 2015). "Space Advocate Makes Business Case For Private Company Exploration Of Extraterrestrial Resources". International Business Times. Archived from the original on 11 October 2015. Retrieved 10 October 2015. ^ a b "VCs Invested More in Space Startups Last Year Than in the Previous 15 Years Combined". Fortune. 22 February 2016. Archived from the original on 8 March 2016. Retrieved 4 March 2016. The Tauri Group suggests that space startups turned a major corner in 2015, at least in the eyes of venture capital firms that are now piling money into young space companies with unprecedented gusto. ... he study also found that more than 50 venture capital firms invested in space companies in 2015, signaling that venture capital has warmed to a space industry it has long considered both too risky and too slow to yield returns. ^ Davenport, Christian (28 January 2016). "Why investors are following Musk, Bezos in betting on the stars". The Washington Post. Archived from the original on 29 July 2016. Retrieved 20 October 2016. ^ "NASA Reaches Milestone in Space Launch Initiative Program". NASA. Archived from the original on 5 August 2008. Retrieved 14 February 2008. ^ "Beal BA-2". astronautix.com. Archived from the original on 5 February 2008. Retrieved 14 February 2008. ^ "Beal Aerospace regrets to announce that it is ceasing all business operations effective October 23, 2000" (Press release). spaceprojects.com. 23 March 2000. Archived from the original on 1 July 2007. Retrieved 21 June 2007. ^ "Roton". astronautix.com. Archived from the original on 9 November 2007. Retrieved 14 February 2008. ^ "Shooting for the Moon: Time is called on Isle of Man space race". independent.co.uk. 11 March 2015. Archived from the original on 14 September 2017. Retrieved 7 May 2018. ^ Foust, Jeff (5 February 2016). "Advanced space propulsion startup shuts down". SpaceNews. Retrieved 5 February 2016. ^ "Golden Spike Company Unveils Plans to Fly Commercial Crews to the Moon". WIRED. 6 December 2012. Archived from the original on 29 September 2013. Retrieved 12 June 2015. ^ "Next-Generation Commercial Space Stations: Orbital Complex Construction". Bigelow Aerospace. Archived from the original on 10 July 2010. ^ BBC Archived 25 December 2015 at the Wayback Machine, accessed 7 October 2015. ^ Krishnan, Alnoor Peermohamed & Raghu (2 November 2016). "Team Indus gets slot on PSLV rocket for its journey to moon". Business Standard India. Archived from the original on 27 January 2017. Retrieved 20 January 2017. ^ Mining the Moon: How the extraction of lunar hydrogen or ice could fuel humanity's expansion into space Archived 10 March 2013 at the Wayback Machine, IEEE Spectrum, June 2009, accessed 5 January 2011. ^ Anne Sewell (1 June 2012). "Mars One: Human settlement on Mars in 2023". Digital Journal. Archived from the original on 4 June 2012. Retrieved 6 June 2012. ^ Adario Strange (1 June 2012). "Dutch Group Planning for Mars Settlement by 2023". PC Mag. Archived from the original on 4 June 2012. Retrieved 6 June 2012. ^ Dario Borghino (4 June 2012). "Mission to Mars meets reality TV". Gizmag. Archived from the original on 7 June 2012. Retrieved 8 June 2012. ^ Belfiore, Michael (27 February 2013). "The Crazy Plan to Fly Two Humans to Mars in 2018". Popular Mechanics. Archived from the original on 2 March 2013. Retrieved 28 February 2013. ^ Morring, Frank, Jr. (4 March 2013). "Serious Intent About 2018 Human Mars Mission". Aviation Week and Space Technology. Archived from the original on 10 May 2013. Retrieved 7 March 2013. ^ Connor, Steve (26 February 2013). "The millionaire Dennis Tito and his mission to Mars". The Independent. Archived from the original on 28 February 2013. Retrieved 28 February 2013. ^ Messier, Doug (4 April 2013). "Garvey Nanosat Launcher Selected for NASA SBIR Funding". Parabolic Arc. Archived from the original on 9 April 2013. Retrieved 5 April 2013. Belfiore, Michael. Rocketeers: How a Visionary Band of Business Leaders, Engineers, and Pilots is Boldly Privatizing Space. Harper Paperbacks, 2008. Bizony, Piers. How to Build Your Own Spaceship: The Science of Personal Space Travel. Plume, 2009. This page was last edited on 28 March 2019, at 19:35 (UTC).